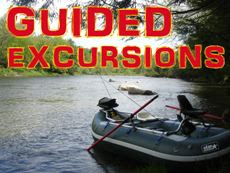 Back in the Fall, I was asked to contribute a chapter to a book called, "50 Best Places to Fly Fish the Northeast." 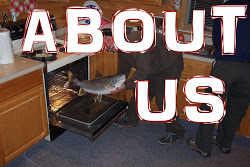 My chapter is about Vermont's Clyde River and it's historical run of Landlocked Atlantic Salmon. 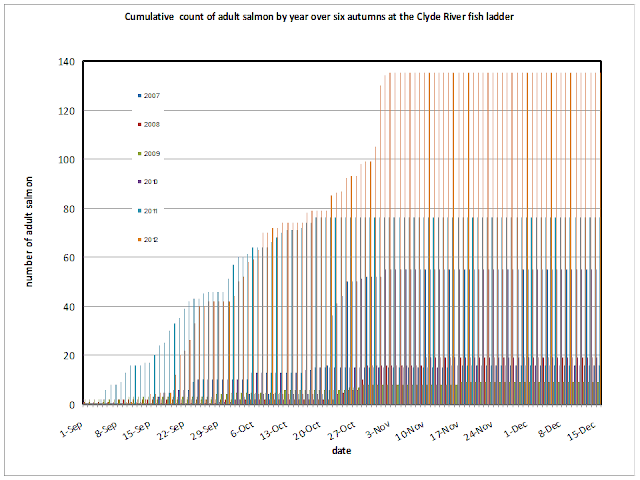 For those of you unfamiliar with the history of the Lower Clyde River, it is one about a tremendous victory by a small group of TU members and concerned citizens to remove a dam that had decimated a once booming fishery. For a short history lesson about the Clyde, check out this video that air on Vermont Public Television by CLICKING HERE. Q. What is the status of the trap and truck regarding fish returns and overall success of the program? A. 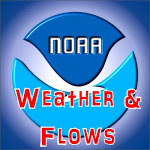 2012 was year 6 of fall operation of the Clyde River ladder&truck, year 5 of springtime operation. 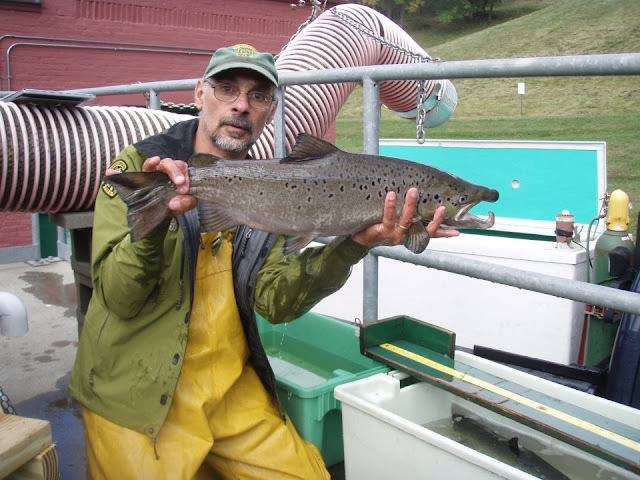 Fish are ascending the ladder in both seasons – landlocked Atlantic salmon and brown trout adults are being moved upstream in the fall; steelhead rainbow trout adults in the spring. 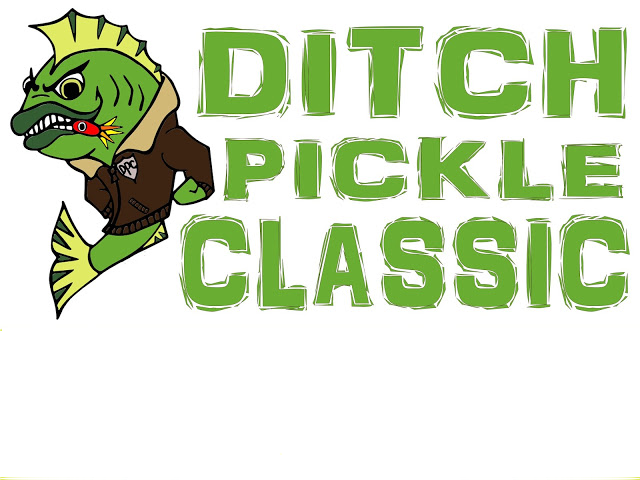 Ask me 10 years from now about the overall success of the program. Way too early to tell at this point. Q. Do you have numbers for the 2012 season? A. 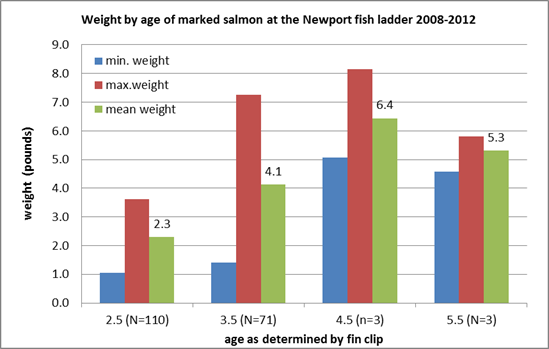 In 2007 VTFW was only peripherally involved with processing fish at the ladder, and the GreatBayHydro staff was not measuring fish. 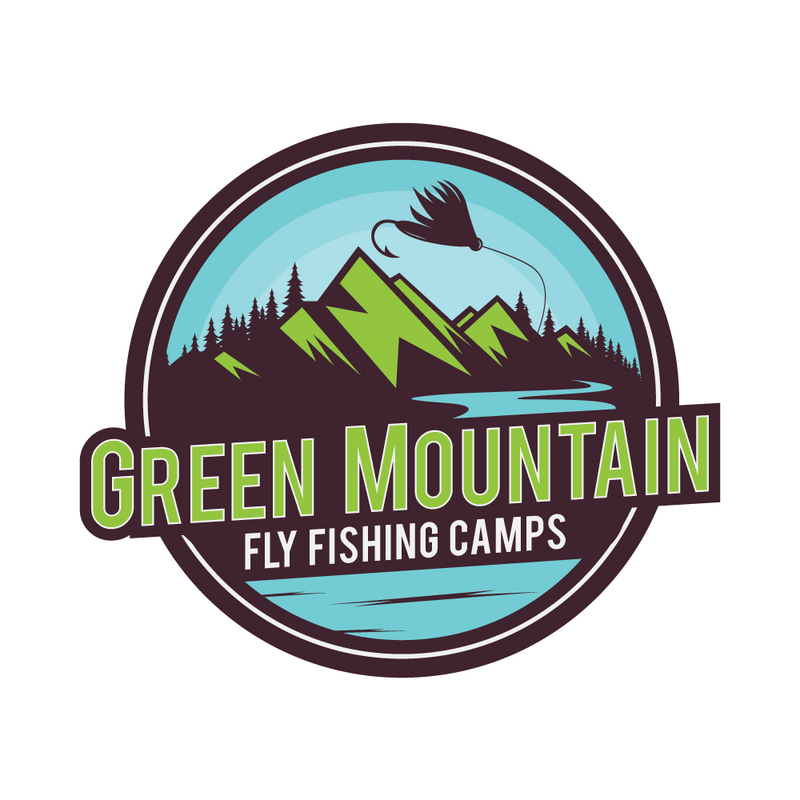 Since then VTFW has had much more hands-on involvement on days when there are truckable fish at the ladder, and GBH has been recording at least approximate measurements for untracked fish on the other days. For 2008 and beyond I don’t have at my fingertips the split between adults and juveniles except for the transport target species for the given season. Q. Do you have an idea of percentage/#'s of fish returning back to Magog and are these drop backs spilling over the dam at Clyde Pond? A. There is a downstream fish passage flume at the Clyde Pond Dam intended to provide a passage route from the vicinity of the penstock entrance headgate (3/4” spaces between the trashrack slats prevents passage) to the base of Clyde Pond Dam. The flume typically is closed roughly from Dec 15 to April 1, and from June 15 through Aug, so there is no downstream passage opportunity during these periods, except when there is spillage over the dam crest. The Newport #1,2,3 power station can operate once river flow exceeds about 60 cfs, (30 cfs minimum gate, plus 30cfs required release at Clyde Pond dam), and can then use all additional flow up to about 480 cfs (~450cfs maximum gate, plus the 30 cfs released at the dam). The only time you see spillage is when river flow drops below 60 cfs in extreme drought conditions and the power station has to shut down for lack of its threshold flow (very minimal spillage ever likely under these conditions ) or when it exceeds 480cfs. Under high flow conditions spillage will range up to 2000 cfs, and outmigrating fish can and do spill safely over the dam. We know this because we’ve had fish we have transported upstream return up the ladder a second time in a matter of days or weeks without using the flume (see below). 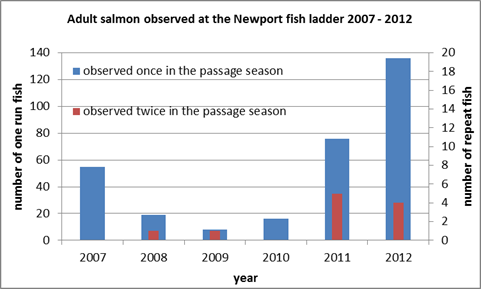 Since 2008 we have been PIT tagging adults at the ladder that that we then transport and release upstream. When these tagged adults return, they have a chance of being data-logged at 3 stationery antennas in the flume system, and then 1600’ downstream at an antenna spanning the river just upstream of where the Newport #1,2,3 powerhouse discharges. The datalogging system can be problematic. Sometimes it trips off interrupting datatlogging; sometimes the antennas go out of tune; sometimes tags aren’t detected because they move through the antenna field too quickly or oriented sub-optimally. This all means that some tagged fish make it through the antennas without detection. A fish has 3 chances in quick succession of being datalogged in the flume system. If there are no reads in flume system but a read downstream at the river antenna (which for technical reasons performs the best of all 4 antennas) that is a strong indication that the fish spilled over the dam. Below are some numbers that show what we know for sure (minimum estimates) from PIT tag reads. 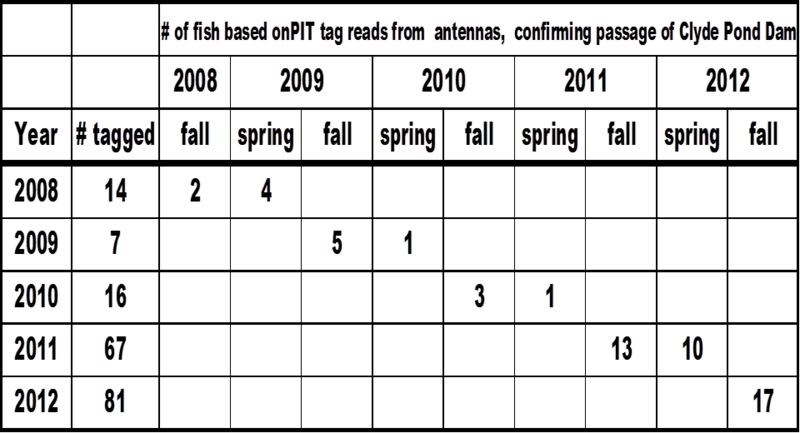 As you can see more kelts leave in the fall after tagging / transport / spawning than leave the following spring. 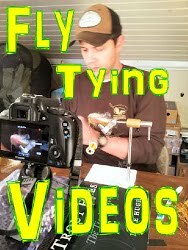 Spring 2013 should augment our information on this a lot because of all the tags we have out. 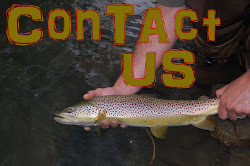 We do have concerns about outmigrating fish not finding and / or not choosing to use the flume. This is likely to remain a matter of investigation by VTFW and GBH for years to come. We have antenna reads at the flume entrance without subsequent reads at the flume exit or the downstream river antenna. This could mean some fish are rejecting the flume and then not having spillage available, so no ready route out of Clyde Pond. We worry that these entrance-reads-only could be the tip of the iceburg, because a fish has to break the plane of the flume entrance to be data-logged. Three feet out in front of it won’t do. So if other tagged fish are getting close, but not entering, we have no record of it at this point. We are reconfiguring that antenna over the next couple weeks to enable reads in the forebay a further distance from the flume entrance. Q. 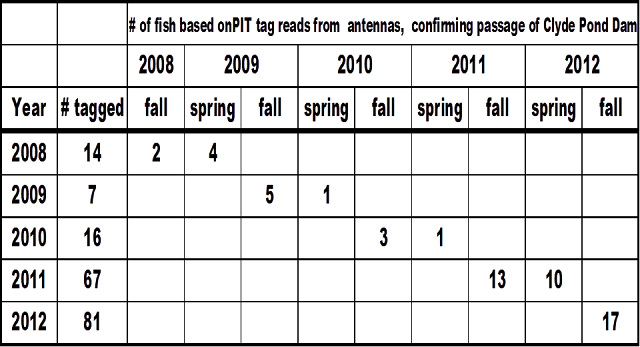 Can you give me an idea of the historical average for when the runs peak in both the spring and fall? A. 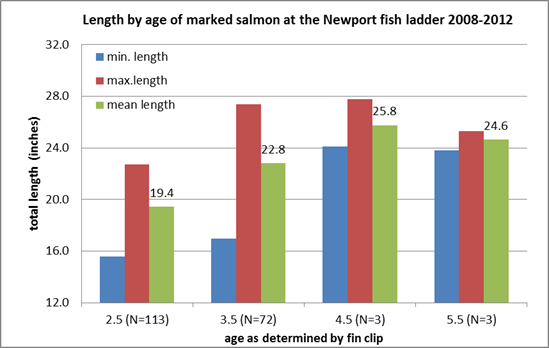 This is a tough graph to read, and it pertains only to adult salmon in the fall, but it gives you the complete picture for that species and season when the fish climbed the ladder. Q. 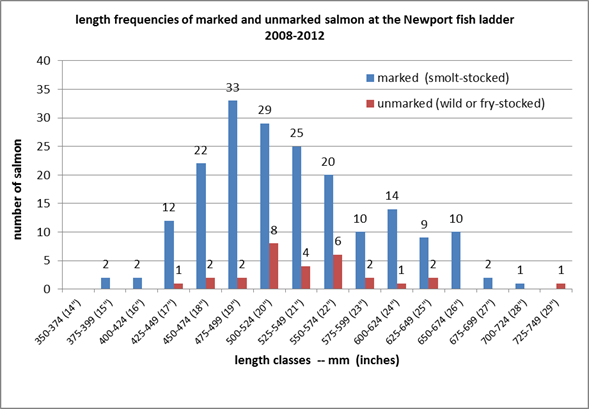 Average sizes of fish making their way up the ladder?